Use the RS3 Solar Radiation Shield to protect your external sensors from sunlight and rain. 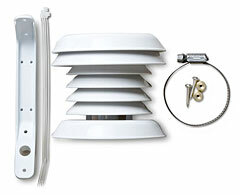 This shield ensures users gain more accurate measurements, due to increased airflow around sensors. And users benefit from 2.5x faster response time to changing conditions. For customers interested in deploying a radiation shield with Onset logger such as a HOBO Pendant or U-Series logger, Onset also offers two other models of solar radiation shields; the RS1 and the pre-assembled M-RSA.